Daycare spaces may all seem like typical child environmental spaces – colours, small furniture and toys are common elements. However, a profession exists that delves into the effectiveness of child play spaces – both indoor and outdoor. Decisions on daycare space design are not made arbitrarily. Consideration is put into layout, safety, beauty, acoustics, educational effectiveness and more. 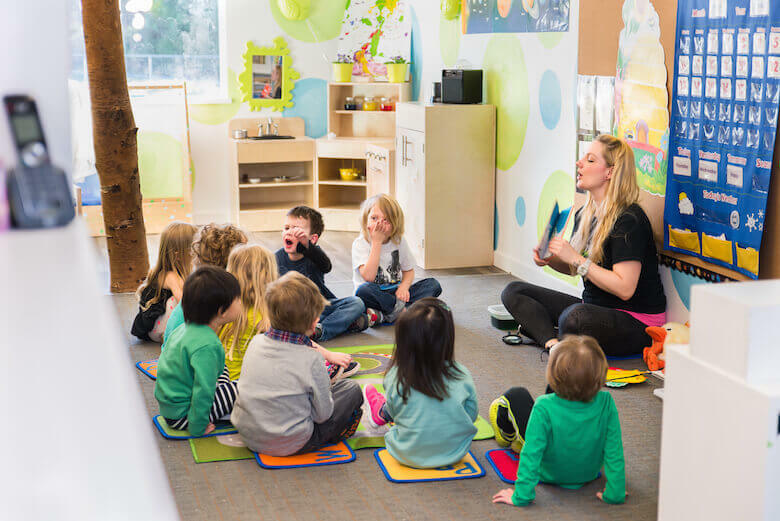 So if you’re shopping around for the best daycare provider in your area, you may be interested in learning about what makes a good daycare space design. Plus, the Parents’ Guide to Selecting and Monitoring Child Care in BC recommends looking into these things too. Many of these principles are well-established amongst early childhood education practitioners. Some are even part of regulatory requirements by government bodies that license daycares. However, others may be based on our years of experience running a daycare. Different daycares meet needs of different age groups. Daycares are often thought of as being for young toddlers or preschool-age children. However, daycare centres also provide before-and-after school care for elementary school kids. So the rooms in which the children operate at daycare should be suitable for their age levels. For example, a daycare space design that is meant for babies and toddlers might have brain-stimulating environments that encourage sensory development, pattern recognition and safe mobility on a level surface. Things like scissors and ropes, used amongst older kids, should not be available in a baby-centered area. A preschool appropriate space could have kiddie tables and chairs for drawing and painting, or a comfy spot for books and quiet activities. Kids up to age 4 or 5 may still need naps, so a full-day childcare program might also have quiet rest areas for this age group. Their bathroom facilities may also contain some modifications or enhancements, like stools, lower-level sinks and toilets, and so on. Kids up to age 12 or 13 will not be stimulated by toddler or preschool activities, of course. So a more mature outdoor space, bigger furniture and access to more complex activities will be important. Kids at this age might also need an environment they can do homework in. Safety and cleanliness often go hand-in-hand. Both are important in a daycare environment, for obvious reasons. Using a floor plan that allows an early childhood educator to scan the entire room, and to find or check on students quickly. Using gates, doors, and other barriers that keep strangers out and kids contained in a reasonable manner. Using cleanable toys and furniture, housing cleaning products in a locked area, and performing regular cleaning routines. Using equipment suitable to the age group of the children in the classroom, as noted above. This can mean avoiding sponge-like toys that toddlers can chew off and choke on, using common baby-proofing or kid-proofing products, screening the materials that kids may bring from home, and so on. Of course, there is more to safety in a daycare. These are just some of the points. Hire staff with safety training and early childhood education backgrounds. Also see our article on allergy management at daycare here. Educate kids on the safety rules of the classroom, such as no throwing rocks, keeping water contained, walking slowly, and so on. Always have adult supervision available, using a maximum number of children-to-educator ratio. Local laws can determine how many children may be in a licensed daycare at a time, the space and movement capacities, plus the caregiver-to-child proportions. In addition to safety, it mentions health regulations such as sunlight exposure and proper ventilation, which are also important in daycare space design. As we’ve discussed on our blog before, children need to play for development. So an educational daycare space should also be playful, and the two can go together. Enough toys and tools for all children to play and learn without tension. Learning materials that encourage multiple areas of intelligence, such as reading, math, music, art and more. Equipment for developing fine and gross motor skills (opportunities to climb, as well as to be artful). Opportunities for practicing and learning social skills with other peers, while also balancing the need for independence. Access to the outdoors and nature. Moreover, when creating an educational space, the function of the area and how it will be used needs to be considered. This can mean cultural considerations, invoking a calming atmosphere, considering the ‘flow’ of the space, and other matters that lend themselves to being able to focus on the education itself. Research about issues such as these, and more, can be read here. Educational space design can take different shapes and forms. For example, this article shows how the Australian government defines “natural” outdoor play spaces. It also explains their benefits. If you are interested in learning more about outdoor playground design, this blog has several resources to check out. We also found this document, which delves into accessibility in outdoor play spaces. 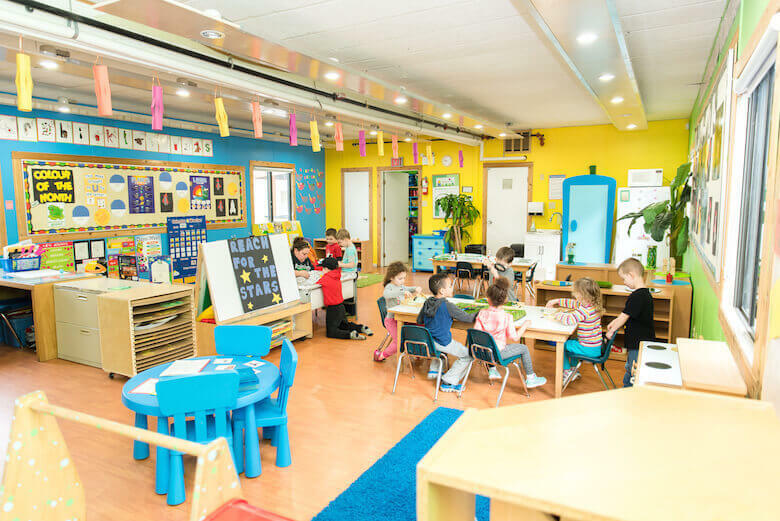 To conclude, we can see through the points above, and linked to in this article, that daycare space planning is an important part of the profession of early childhood education. The care of children in daycare is well thought-out and developed over years of research and experience. Finding a space that meets the needs of your child can make a big difference in how they will benefit from child care.